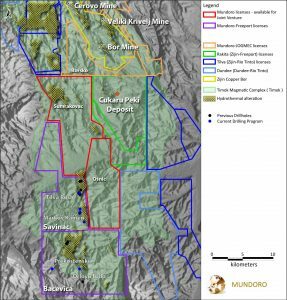 April 5, 2019, Vancouver, BC – Mundoro Capital Inc. (TSXV: MUN, www.mundoro.com) (“Mundoro” or the “Company“) is pleased to announce the completion of the initial target testing drill program at the Savinac and Bacevica exploration licenses (the “Freeport-Mundoro Projects”) in the Timok Magmatic Complex (“Timok”) in eastern Serbia. The exploration programs on the Freeport-Mundoro Projects are sole funded by Freeport-McMoRan Exploration Corporation (“Freeport“) as part of the earn-in agreement (“Agreement“) with Freeport, in which Mundoro has granted to Freeport an option to earn-in to the Freeport-Mundoro Projects. The Freeport-Mundoro Projects are located within the southern portion of Timok in eastern Serbia, one of the most prolific metallogenic domains in the Tethyan Belt with deposits such as the Cukaru-Peki deposit, the Bor copper porphyry underground mine and the Veliki Krivelj copper-gold porphyry open-pit mine (Figure 1: Freeport-Mundoro Project Location Map). A total of 4,778 m of diamond drilling has been completed in seven drill holes. Planning has commenced for geophysics surveys and alteration mapping at both licenses as part of the 2019 exploration program. The aim of the initial target testing drill program was to test four target areas located along the 16-km elongated zone of extensive hydrothermal alteration defined by mapping and Cu-Mo-Au-Ag-Pb-Zn geochemical anomalies (see Figure 2: Map of Targets, Hydrothermal Alteration, Drill Hole Locations and Planned Geophysics). This target is a large area of 2.5 km by 1 km of advanced argillic alteration containing epithermal gold mineralization cropping out at surface as observed through trench sampling by Mundoro in 2013 which returned 12 m of 30 g/t gold and 171 g/t silver. Interpretation of drill results suggests the epithermal mineralization is proximal to a copper-gold porphyry system. Drill hole FMSC18006, was collared near this surface gold mineralisation and orientated to drill through the mineralization. Final depth of drill hole reached 1154.9 m.
The drill hole intersected an interval for 263 m of fragmental volcanics from 190 m that display patchy-kaolinite texture with banded quartz-magnetite-specularite veins, which is suggestive for proximal porphyry source of the mineralization. A fault zone containing vuggy silica, massive pyrite, barite and patches of sphalerite cross cut the fragmental volcanics and returned a high grade interval of 7.3 m of 0.18% Cu and 3.22 g/t Au (2.39% CuEq) (see Table 1). At depth, the drill hole intersected diorite dykes that contain traces of chalcopyrite mineralization indicating relation to a porphyry source. Patchy texture, with dickite and pyrophyllite was also observed and mapped on surface 300 meters to the north of drill hole FMSC18006 and remains a compelling target for future testing. Targeting will continue with IP-Resistivity and CSAMT/NSAMT geophysics after which further drilling can be planned. This area is another epithermal target identified by several copper-gold-in-soil geochemical anomalies related to 4 km by 1.2 km zone of argillic and advanced argillic alteration. It is located 2 km south of the Tilva Rosh target (see Figure 2). One hole drilled in 2015 at Markov Kamen intersected hydrothermal breccia, massive sulphides and vuggy silica, suggesting high-sulphidation type epithermal mineralisation controlled by northwest structures. FMC18003 with 22.7 m of 0.46 g/t gold from 78.7 m.
All three drill holes were terminated in andesitic country rock that display propylitic alteration at the east. Measured contacts to the country rock suggest the advanced argillic zone and the epithermal mineralisation remain open towards the west. 12.0 m of 0.24 g/t gold from 469.0m. The advanced argillic zone remains open down plunge to the south and west beyond the vertical depth of 1200 m, where the drill hole was terminated due to the drill rig capacity. Targeting will continue with alteration mapping, IP-Resistivity and CSAMT/NSAMT geophysics after which further drilling can be planned. 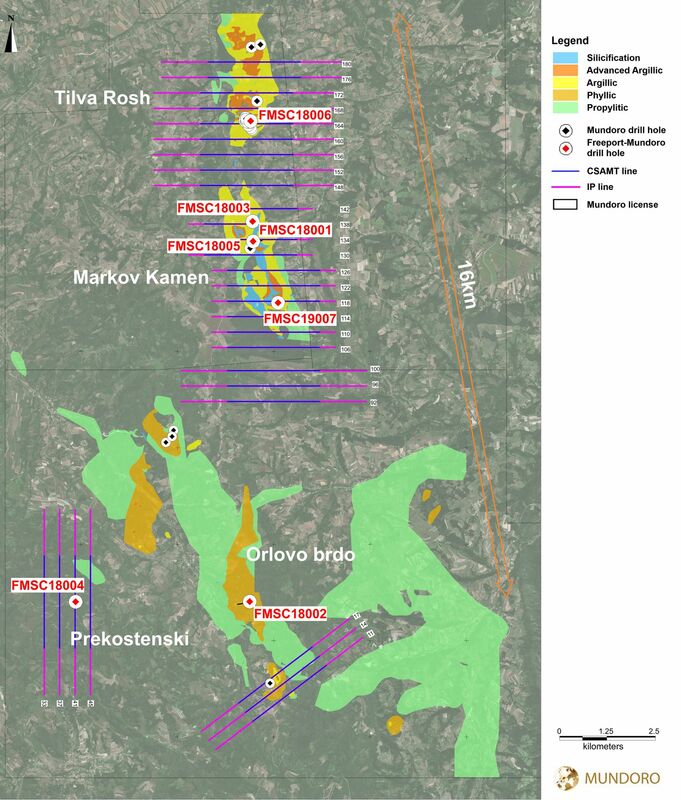 This area is a copper-gold porphyry target identified from geochemical analysis surface sampling which resulted in 55 m of 0.28 g/t gold and 0.21 % copper located in the western portion of the Bacevica license. The exploration work identified chalcopyrite-magnetite mineralisation hosted by potassic altered diorite. Drill hole FMSC18004 confirmed the extension of the surface mineralisation to a depth of 68.6 m. Quartz-pyrite-chalcopyrite veins were observed hosted in potassic altered diorite porphyry and returned an intercept of 49.8 metres of 0.14 g/t gold and 0.13 % copper from surface (see Table 1). Detailed mapping, CSAMT/NSAMT and IP-Resistivity geophysics are planned in order to better define the lateral and vertical extension of the mineralised porphyry. This target is a broad zone of phyllic alteration of 3 km by 700 m with gold and copper anomalism located at the central portion of Bacevica license. One drill hole FMSC18002 was completed to a depth of 837 m. The drill hole intersected a zone of quartz vein stockwork mineralization related to potassic altered diorite at depth of 458 m overlain by phyllic alteration from surface. An intercept of0 metres of 0.23 g/t gold and 0.10 % copper from 458.0 m (see Table 1). Detail mapping, CSAMT/NSAMT and IP-Resistivity geophysics are planned in order to better define the lateral and vertical extension of the mineralised porphyry. Copper equivalent (CuEq%) is calculated using the formula CuEq = (%Cu) + [(g/t/AuEq) x (1/31.1035) x ($/ozAu)] ÷ [(22.0462) x ($/lbCu)]. Metal prices used are: gold price of US$1,268/oz, copper price of US$2.7/lb, the average for the last 3-year period. All thicknesses from intersections from drill holes are down-hole drilled thicknesses or outcrop sample length thickness and not true widths. The drilling technique was triple tubed diamond drilling from surface for PQ and HQ, while for NQ was double tubed. The drill holes were generally cased from surface progressing from PQ to HQ at 260m on average, however exact depths vary from hole to hole. Drill hole orientations were surveyed at approximately 30 meters intervals. Drill core was oriented using the Reflex EZ-Trac and Devico Pee Wee tools, the bottom of the core was marked by the drillers and this was used for marking the whole drill core with reference lines. Company personnel monitored the drilling, with drill core delivered daily to the Company’s core storage facility where it was logged, cut and sampled. Core recovery was measured and recorded continuously from the top to the end of the hole for every drill hole. Each run of 3m length was marked by plastic core block which provided the depth drilled. Core recovery is recorded as 96.3-100% in most intervals. The drill core was sawn into quarter for PQ diameter and into two for HQ and NQ diameter, along drill core orientation line using a core-cutter and left half looking downhole was collected in bag and submitted for analysis, the other half is kept in tray and stored. Samples were collected at two-meter lengths from mineralised intervals and three to five-meter lengths from non-mineralised intervals with brakes for major geological changes. The samples were submitted to ALS Prep Laboratory in Bor, Serbia, for sample preparation and then internally submitted to ALS Romania and ALS Ireland for analysis. The samples were fine crushed to 2mm with 70% pass, split by rotary splitter to produce 1000 g sub-sample which was pulverized with 85% passing 75 um using. The samples were assayed using 50 grams charge for Au-fire assay with AES finish and multi-element method ME-MS61 – 48 element four acid ICP-MS. Samples returned above > 3 ppm Au, >1% Cu, >1% As and >100 ppm Ag were additionally analyzed with method OG62. In addition to the laboratory’s internal QA/QC procedures, the Company conducted its own QA/QC with the systematic inclusion of certified reference materials every 20 and 30 samples, blank samples every 50 samples, field duplicates every 50 samples, crush duplicates every 50 samples and pulp duplicates at every 50 samples. 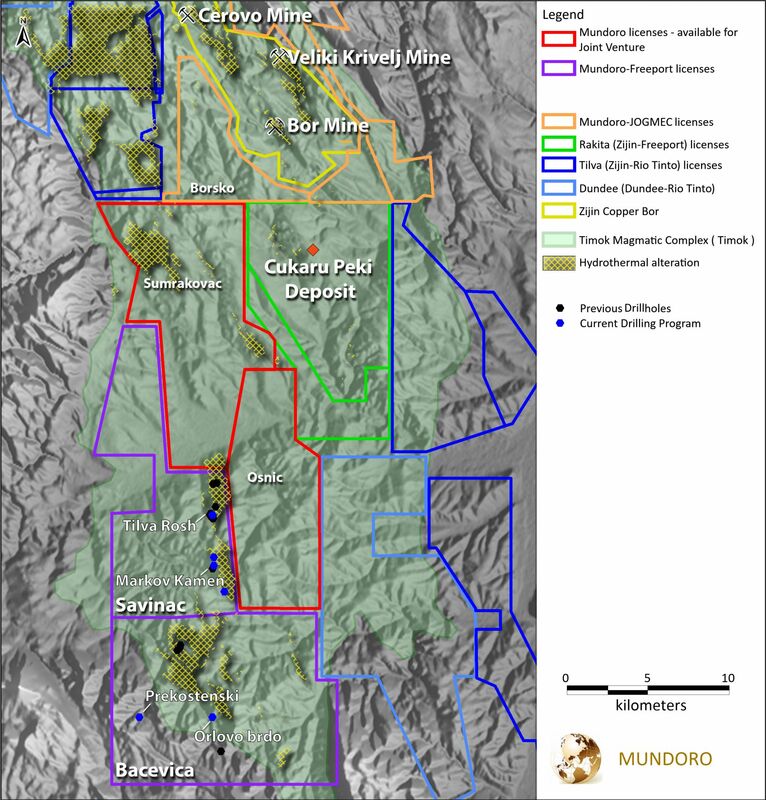 Mundoro is a Canadian mineral exploration and development public company focused on building value for its shareholders through directly investing in mineral projects that have the ability to generate future returns for shareholders. The Company holds a portfolio of projects in Serbia and Bulgaria as well as an investment in a producing gold mine in Bulgaria. 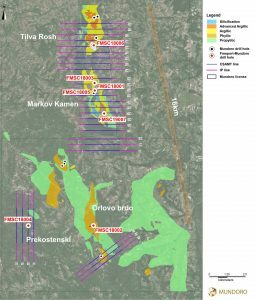 There are eight licenses in Serbia, four of which are optioned to JOGMEC, two licenses are optioned to Freeport-McMoRan Exploration Corporation and two licenses are available for joint venture. In Bulgaria, Mundoro has formed a Generative Alliance with JOGMEC. Mundoro’s common shares trade on the TSX Venture Exchange under the symbol “MUN”. This News Release contains forward-looking information and statements (“forward-looking statements”) under applicable securities laws. All statements, other than statements of historical fact, included or incorporated by reference in this News Release are forward-looking statements, including, without limitation, the completion of exploration work on any projects and licenses and results of that exploration work, the prospect of one or more joint ventures, options and other statements regarding activities, events or developments that the Company expects or anticipates may occur in the future. These forward-looking statements can be identified by the use of forward-looking words such as “will”, “expect”, “intend”, “plan”, “further”, “estimate”, “anticipate”, “believe”, “promising”, “encouraging” or “continue” or similar words or the negative thereof. The material assumptions that were applied in making the forward-looking statements in this News Release include expectations as to the Company’s future strategy and business plan and execution of the Company’s existing plans. There can be no assurance that the plans, intentions or expectations upon which these forward-looking statements are based will occur. We caution readers of this News Release not to place undue reliance on forward-looking statements contained in this News Release, which are not a guarantee of performance and are subject to a number of uncertainties and other factors that could cause actual results to differ materially from those expressed or implied by such forward-looking statements. These factors include general economic and market conditions, changes in law, regulatory processes, the status of Mundoro’s assets and financial condition, actions of competitors and the ability to implement business strategies and pursue business opportunities. The forward-looking statements contained in this News Release are expressly qualified in their entirety by this cautionary statement. The forward-looking statements included in this News Release are made as of the date of this News Release and Mundoro undertakes no obligation to publicly update such forward-looking statements to reflect new information, subsequent events or otherwise, except as required by law. Shareholders are cautioned that all forward-looking statements involve risks and uncertainties and for a more detailed discussion of such risks and other factors that could cause actual results to differ materially from those expressed or implied by such forward-looking statements, refer to the Company’s filings with the Canadian securities regulators available on www.sedar.com. Neither TSX Venture Exchange nor its Regulation Services Provider (as that term is defined in the policies of the TSX Venture Exchange) accept responsibility for the adequacy or accuracy of this release. Mundoro is a Canadian mineral exploration and development public company focused on building value for its shareholders through directly investing in mineral projects that have the ability to generate future returns for shareholders. The Company currently holds a diverse portfolio of projects in two European countries as well as an investment in a producing gold mine in Bulgaria and a feasibility stage gold project in China. The Company holds eight 100% owned projects in Serbia, the four Timok North Projects are in option to JOGMEC, and the four Timok South Projects are being advanced by Mundoro. Mundoro’s common shares trade on the TSX Venture Exchange under the symbol “MUN”. Copyright © 2019 Mundoro Capital.